Here is one you can put on your weeknight recipe repertoire. 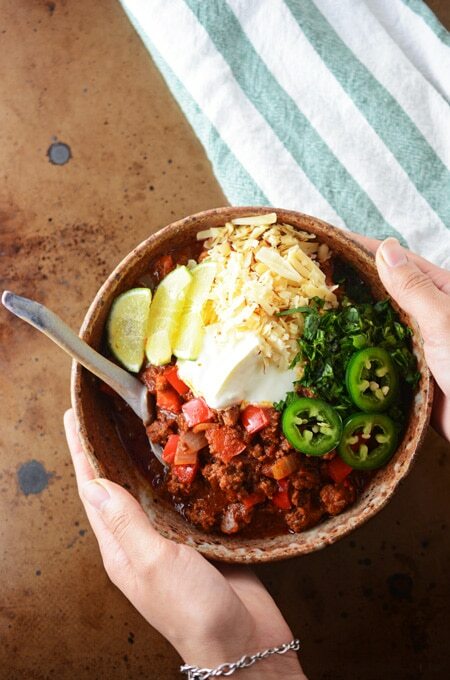 This Easy Weeknight Chili is also a great option for lower-carb dieters since there are no beans in this recipe. It’s also under 500 calories for those calorie counters out there. A typical beef chili needs quite a bit of simmering time to get those flavors to meld. 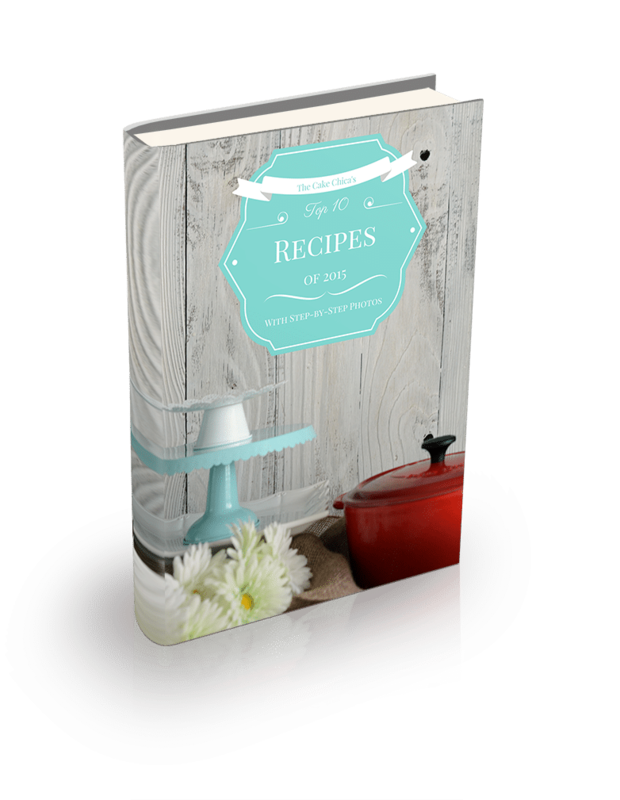 But I have a secret ingredient to share with you….. and it’s enchilada sauce! Instead of simmering for hours you can use enchilada sauce to add some flavor. Now one very important TIP: Use an enchilada sauce you love!!! 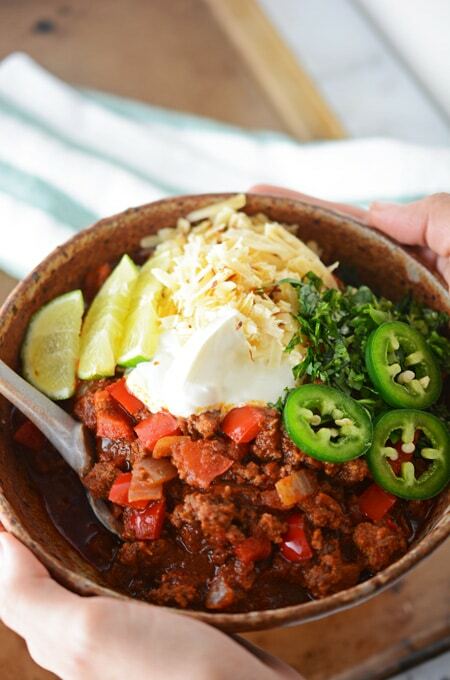 This is where this Easy Weeknight Chili gets most of it’s flavor from. 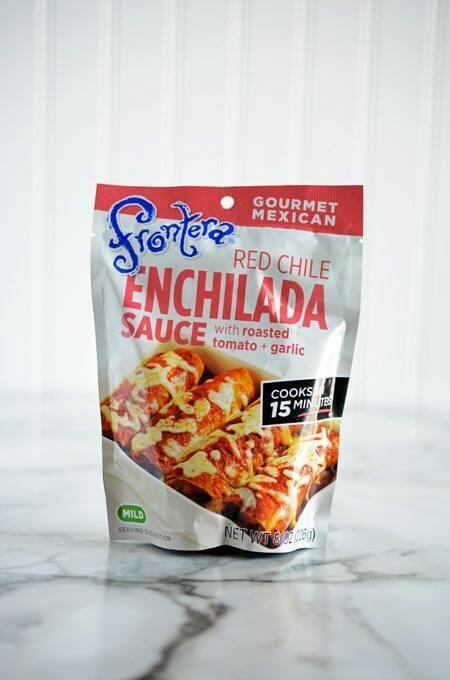 I haven’t found a canned enchilada sauce that I liked until I tried Frontera brand enchilada sauce. It’s pretty new, but I’ve seen it at Kroger, Sprouts and Thrive Market. I highly recommend this brand for this recipe. Or make your own enchilada sauce. 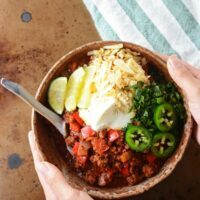 Not only does this recipe make a great chili but my husband actually made a sloppy joe out of it because it’s nice and thick and does tend to have the consistency of a sloppy joe filling. He loved it! So, I’ve got a very versatile one for you here this week. Top this with your favorite chili toppings, mine are smoked gouda and sour cream with a few saltine crackers. 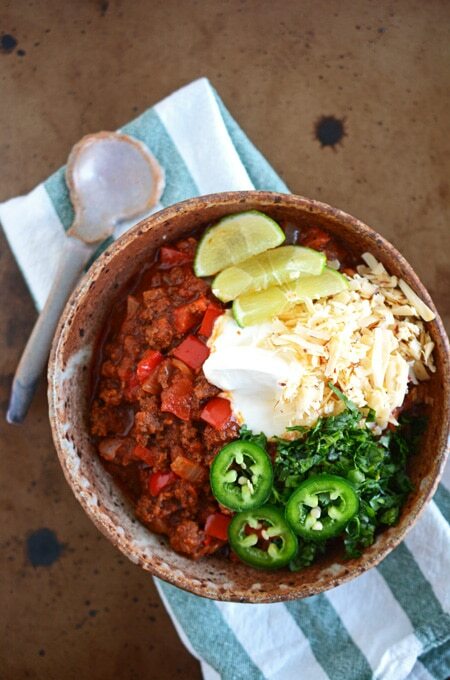 How do you top your chili? Let me know in the comments below. You can find The Cake Chica on these social media platforms: Facebook, Instagram, Twitter and Pinterest. In a Dutch oven over medium-high heat add 1 tablespoon olive oil and cook the onions and bell pepper, about 8 to 10 minutes. Remove the veggies from the Dutch oven and set aside. Add beef to the Dutch oven and cook. Drain fat. Season beef with cumin, garlic, and salt and stir to combine. In a small saute pan over medium-high heat, add 1 tablespoon olive oil and fennel seeds and toast until browned. Add the toasted fennel seeds to the meat and stir to combine. Cook until beef is cooked through. Add enchilada sauce, chipotle peppers and tomato paste, stirring well. 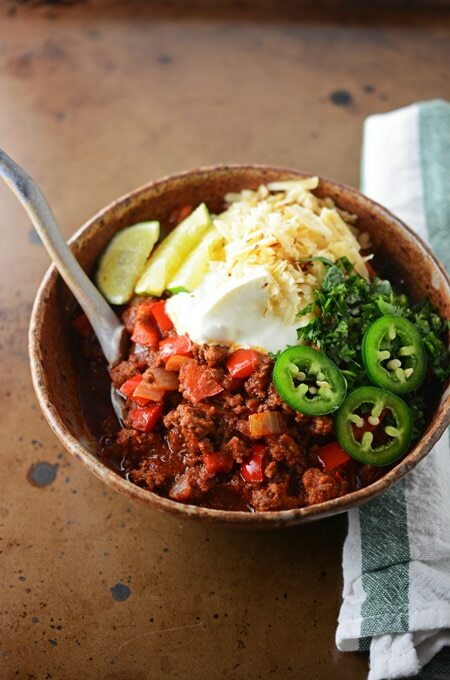 Bring chili to a simmer and taste for seasoning. Top with your favorite garnishes and serve. 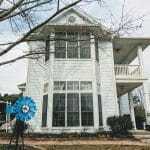 Nutritional information are estimates and will vary according to brands used. Nutritional information does not include chili toppings.